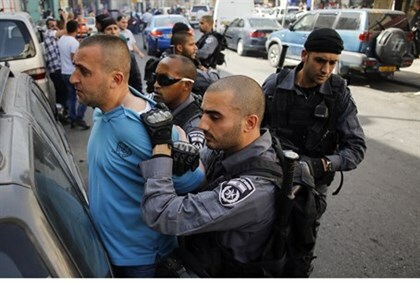 Israeli police said Monday that eight Arab residents of Jerusalem have been arrested for inciting anti-Jewish violence in postings on the Internet. The eight were detained last week for “inciting hatred, violence and terrorism” against Jews and Israeli security forces, mostly with messages and videos on Facebook, a police spokesman told AFP. The spokesman said one of the suspects had posted a picture of himself with an M16 assault rifle. Such postings had resulted in “many messages of support on Facebook,” he said. The operation was the Israeli police’s “biggest aimed at repressing this kind of incitement to violence on social networks and the Internet,” the spokesman said. The arrests come at a time of heightened tensions, after Palestinian terrorists carried out a string of deadly attacks against Israeli civilians over the past several months. The deadliest such attack occurred on November 18, when two Palestinians armed with meat cleavers and a pistol attacked a Jerusalem synagogue, killing five people, before they were shot dead. As in most previous attacks the terrorists were residents of Jerusalem. Those attacks took place against a backdrop of regular riots and violence against Israeli police and security forces, although those disturbances have quietened somewhat as of late, as police conduct a crackdown on the instigators. Online incitement by Islamists was highlighted several weeks previously, after the attempted assassination of Jewish Temple Mount activist Rabbi Yehuda Glick. Glick had repeatedly received death threats from Muslim extremists, and images and messages encouraging his murder had been circulating on social media pages associated with Islamists and other Arab extremists. Following his near-fatal shooting, Islamists circulated a list of several other Temple Mount activists, included MKs and even government minister Uri Ariel. Arabic-language social media sites have also been glorifying the recent spate “car-terror” and knife attacks, encouraging others to follow suit.